Cakes are always so much fun to make! While neither of us would necessarily call cake our favorite dessert (we prefer things like ice cream, cheesecake, chocolate chip cookies, and anything citrus…a lemon bar sounds good right now), we love to make them. This cake, however, is fun both to make and to eat. It is spectacular! It starts with a super chocolatey cake that isn’t dry, like some tend to be. The layers weren’t quite as tall as we wanted them to be, but once there was frosting between them, the cake looked fine. And it tasted so good that it more than made up for the height.We topped the cake with our favorite cream cheese frosting and a cloud of coconut. It’s based off of one of our mom’s best-loved cupcake flavors from a little cupcake place in Princeton, NJ (best town ever) that is one of our favorite cupcake places. It is a perfect combination of flavors! Technically, this is our mom’s birthday/yay, we made it through midterms cake. Her birthday was in December, but we were taking the SATs and had a broken oven, so no homemade cake. And, since we don’t need much of an excuse to make cake, we figured better late than never. Plus, before it is cut, it looks kind of like a snowball, so it’s a great January cake! Heat oven to 350°F. Grease three 8-inch cake pans, line with parchment paper, and grease and flour the parchment. Stir together sugar, flour, cocoa, baking powder, baking soda and salt in large bowl. Add eggs, milk, oil and vanilla; beat on medium speed of mixer 2 minutes. Stir in boiling water. The batter will be very thin. Pour batter into prepared pans. Bake 30 to 35 minutes or until wooden toothpick inserted in center comes out clean. Cool 10 minutes; remove from pans to wire racks. Cool completely. Place one cake round on a pedestal, turntable, or plate and cover with frosting. Repeat with the next layer. Put the final layer on top and cover the cake with frosting. 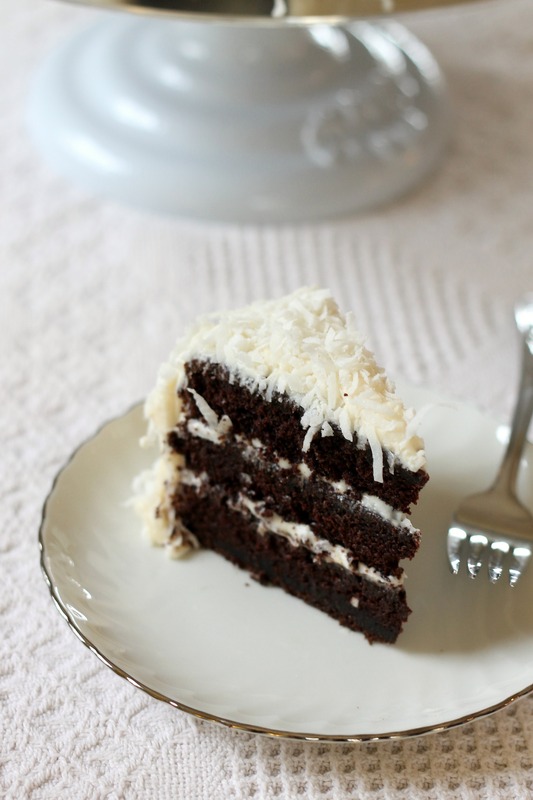 Normally when frosting a chocolate cake with a light-colored icing a crumb coat is necessary, but since the cake will be covered with coconut, there is no need. 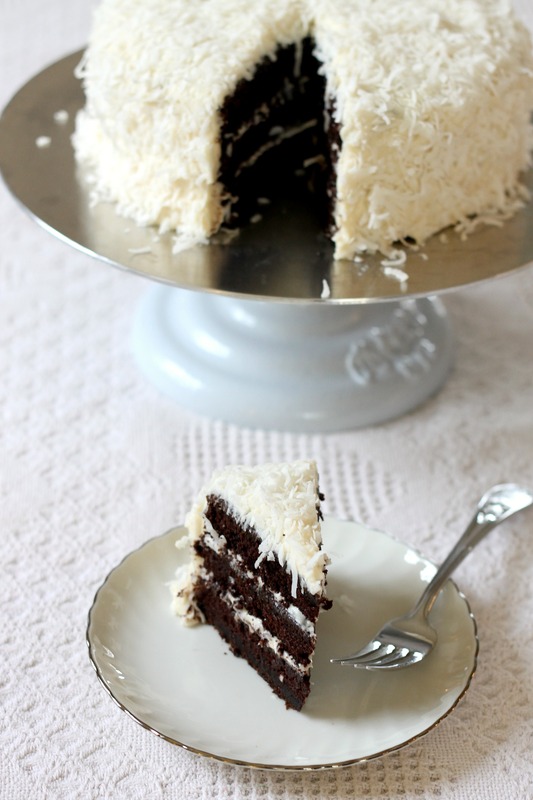 Press coconut into the top and sides of the cake until it is completely covered. Enjoy! Looks amazing! I agree it’s snowball-like appearance makes this great for January!